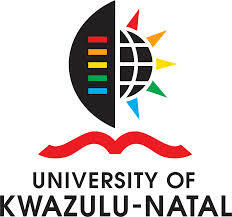 UKZN’s Dr Stephen Ojwach, a Senior Lecturer in the School of Chemistry and Physics, attended the Lindau Nobel Laureate Meeting in Germany as one of 600 highly-talented young researchers chosen internationally from more than 80 000 nominees. The Meeting stands as one of world’s most revered and respected forums for the scientific exchange across not only the different disciplines, but also across generations and nationalities. Now in its 63rd year, the 2013 Lindau Nobel Laureate Meeting was attended by 35 Nobel Laureates in Chemistry and was dedicated to the discipline. ‘I was elated to be among the top young researchers selected to attend this prestigious event. The opportunity to come face to face with 35 Nobel Laureates in one meeting was a milestone in my career,’ said Ojwach. His experience at the Meeting and the composition of the Nobel Laureates allowed Ojwach to make the keen observation that ‘Africa is far behind in research and more needs to be done on the African continent to improve the productivity and quality of research’. The Meeting’s programme included plenary lectures which were given by the Nobel Laureates on their Nobel Prize research, followed by discussion sessions where young researchers had the opportunity to have closer interactions with the Nobel Laureates. The discussions proved to be a fruitful exchange as the Nobel Laureates fielded questions from young researchers touching on their research experience, the impact of winning the Nobel Prize and the requirements of becoming a Nobel Laureate. The meeting also involved panel discussions covering various topics on energy and environment, green chemistry and communicating science. Master classes offered selected young researchers the opportunity to present their research and then engage in detailed discussions with the Laureates. Science breakfasts also took place as an additional forum for more informal sessions. Ojwach draws from Nobel Laureate Professor Dan Shechtman’s experiences that mounting criticism from peers should not demoralise researchers but rather increase the desire to achieve their goals. Shechtman suffered years of rejection by leading scientists including the double-Nobel winner Professor Linus Pauling. ‘The humility of the Laureates was gratifying, and from their research profile, I learned that it is of utmost significance that one carries out intensive research – more detailed research in a specific field – in order to gain international recognition and have an immense impact in one’s respective research niche,’ concluded Ojwach. 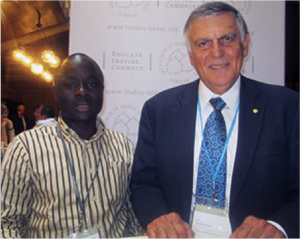 Image: Dr Stephen Ojwach and Professor Dan Shechtman during the 63rd Lindau Nobel Laureate Meeting.